A little bit of history Lamy have been making pens in Germany since 1930, when a Herr Joseph Lamy, then working for Parker Pens, no less, bought up another pen company and went into business. Joseph, and then his son, Manfred, ran the company for 76 years. In that time they produced one of the most respected fountain pens there is, the 2000 – its 1966 design still looking fresh and modern – as well as what is perhaps one of the most easily recognised, almost ubiquitous, fountain pens, the Safari. This particular model isn’t so well known but a reader asked if we could look at it and, thanks to Cult Pens kindly sending us review samples, we’re glad to be able to share our thoughts on the Lamy Accent. How it looks Very similar to a lot of other Lamy pens, actually. The wooden grip is pretty stylish and offsets the sleek palladium barrel. In our collective opinion, it’s reminiscent of a 1970s hotel lobby, which is no bad thing, forty years on. How it feels Hmm… not so great for us, sadly. The grip is high, hard and comparatively wide, which meant none of us found it very comfortable to write with. But we found friends who really liked it, so if you hold your pen high up – perhaps for drawing with – it might suit you better. When posted, the pen is a little long for some, but unposted it’s a good weight and length. Crucially, how it writes… The reader who asked us to review the Accent liked the MK nib, with its round-balled tip, and this has now become the shape for the standard M nib, although a side by side comparison suggests the MK is a little wider. Flow is good and it writes nicely. As with all Lamy pens in this price range (and below), nibs are easily interchanged and are very good value. Pen! What is it good for? It looks great but we found it rather uncomfortable for extended periods of writing – so we’d say it’s best for quick notes or sketching. VFM The Accent is well-made, from good quality materials, but it’s hard to justify spending this much money for a pen if you’re not going to keep using it. Much depends upon whether that unusual grip suits your style. If this isn’t quite your cup of tea, but almost… Lamy produce a lot of similar-looking pens without the bulging grip, the Logo being particularly good. If wood and shiny metal is your thing, the Faber-Castell Ambition is a similar price and looks fantastic. It’s quite possible that the version of the Lamy Accent with the rubber grip is more comfortable, too. Our overall recommendation Definitely try before you buy. If you get on with the grip then it’s a good solid choice, but if you find it as uncomfortable as we did, you may not be delighted. Where to get hold of one We’re very grateful to Cult Pens for donating these pens for review – we’re all impressed customers and generally feel that you can’t go too far wrong there! If you want to shop around then, to be honest, it’s hard to find a fountain pen shop anywhere that doesn’t stock Lamy pens. That seems like a vote of confidence in itself. Thanks to Cult Pens for providing the pens we reviewed, at double-quick speed too – that really helps us. Thanks to them for providing the Deep Dark inks, too – see the details of an exciting give-away just below! Giveaway! Cult Pens, in conjunction with Diamine, have their very own range of “Deep Dark” inks: Deep Dark Blue, Brown, Purple, Orange, Green and Red. They have very kindly offered up a set of all six of these inks, in 30ml bottles, for one lucky reader. Entries have now closed, and we’ll be in touch with the lucky winner soon. Just to make sense of the comments below, we asked entrants to tell us which Diamine ink colour was there favourite. We had a little think about what our own favourite Diamine inks are and came up with: Imperial Purple – Scribble, Asa Blue – Ruth, Twilight – Ian (who really couldn’t make up his mind and wanted to pick Autumn Oak and China Blue too, but that’s not allowed). As for our readers’ choices, well, they’re illuminating. Recently I have been liking the Imperial Purple more at the moment. I’ve fallen hard for Diamine Syrah. Very close toOxblood, but with a slightly more purple undertone and on Tomoe River I also get some gold sheen. Absolutely love it. As much as I love purples (Imperial Purple and Amazing Amethyst in particular) I think Teal is my favourite Diamine. Sapphire Blue is my favourite. Thanks! I love Apple Glory – so vibrant! I’m a fan of WES Imperial Blue. I’ll go with Ancient copper, so profound! Diamine Evergreen goes great with my Noodler’s Jade Ripple Konrad and my dark green 1950 Sheaffer’s Sentinel Deluxe touchdown. Of the Diamine inks I’ve tried, I like Midnight the best. It’s probably my favorite blue-black that I’ve used, too. Diamine Raw Sienna for me. My favorite is Autumn Oak, nice and solid and good contrast to so many other inks. 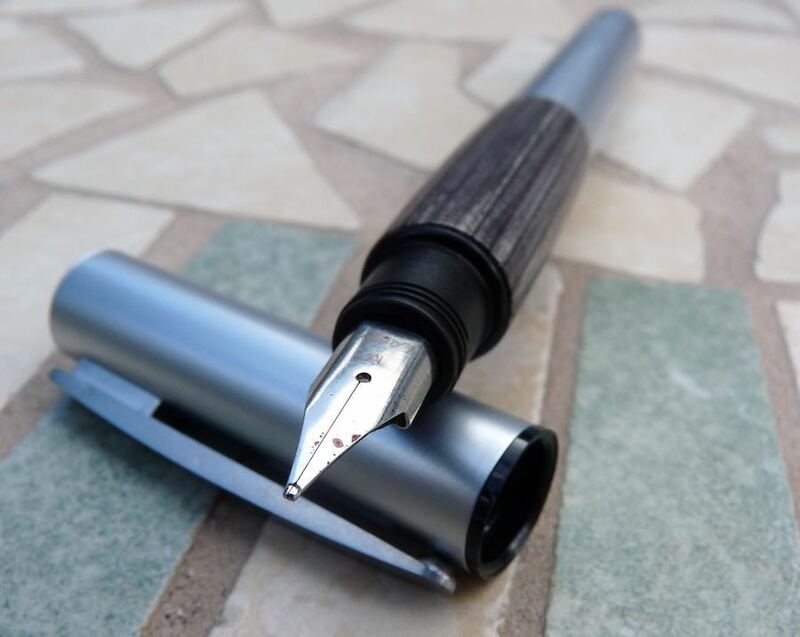 Thanks for writing this review – I have been thinking of getting a Lamy pen, but perhaps not this one! My favourite Diamine ink colour is Bilberry.